Rated 56/100 based on reviews from all travelers. "Located near shopping areas. Room needs to be improved. Vibe is not too good." "Complaints about maintenance and cleanliness in rooms and bathrooms." Average-sized rooms with alright beds. Old rooms with complaints about the furniture, minibars, and A/C. Shower can be a problem. "Vibe is not too good. Hotel could use some updating." Entrance area is not particularly attractive. Rated 49/100 based on reviews from couples. Rated 48/100 based on reviews from families. Rated 50/100 based on reviews from all travelers. "Reception and service are alright." Service is professional and friendly. Run down, seedy. The air was stale, could get fresh air without leaving the door open. Never again. The experience staying in your hotel was a nightmare. The lobby was very drab, the entrance reeked of smoke due to the staff smoking by the door. This hotel is in horrible disrepair, I overpaid for the night stay, we didn’t even bother to check out breakfast couldn’t wait to get out in the morning. To pay more than 100 USD for a night stay at this place one would expect more. The reception staff was passive and uninterested both on check in and out. Room had an almost sickening smell, several electric appliances not working and the electrical outlets was soon-to-get-a-short-circuit-black. Breakfast was just in the same division, fat and boring, few to none selections. Very disappointed. My stay was one of the worst stays that I have had at a hotel in many, many moons. There was only one person to check people in during check-in time, all of the trash cans were overflowing with trash on the property. The nonsmoking room and hallway leading to the room had a pungent smell of old cigarette smoke, it was really, really sharp and piercing to the senses. The bathroom had a used bath cloth hanging on the shower curtain rail and the shower curtain was too long for the shower. The shower hanger had been pulled out of its original mounting and it was mounted below the old mounting making it to long. Now you had the shower curtain in the bottom of the tub with you. The breakfast bar did not look appealing so we did not eat breakfast there moreover the dining area is very small. We only stayed there because every place else was booked. I guess I can't complain too much for $62.00 a night, lol, I'm glad it was only for one night! Roaches in the bathtub, small beds, feet having off the bed, too expensive I paid 136$ a night. The location was just bad, guys hainging outside, music playing loud. I think the guy over charged me because he kept saying you know it’s 136 a night. With a stay at Days Inn & Suites by Wyndham Rocky Mount Golden East in Rocky Mount, you'll be within a 5-minute drive of Rocky Mount Sports Complex and Golden East Crossing Mall. This motel is 1.6 mi (2.5 km) from Stonewall Manor and 1.8 mi (2.9 km) from Rocky Mount Mills. Make yourself at home in one of the 151 air-conditioned rooms featuring refrigerators. Complimentary wireless Internet access keeps you connected, and cable programming is available for your entertainment. Private bathrooms with shower/tub combinations feature complimentary toiletries and hair dryers. Conveniences include desks and coffee/tea makers, as well as phones with free local calls. Featured amenities include a 24-hour front desk, laundry facilities, and an elevator (lift). Planning an event in Rocky Mount? This motel has facilities measuring 500 square feet (45 square meters), including a meeting room. Free self parking is available onsite. Complimentary Wi-Fi throughout the hotel. Password provided. Provided at no cost to the guest. Pool access available from 11:00 AM to 9 PM. Rocky Mount-Wilson Regional Airport (RMT): Approximate distance to Days Inn Rocky Mount-Golden East is 11 miles. 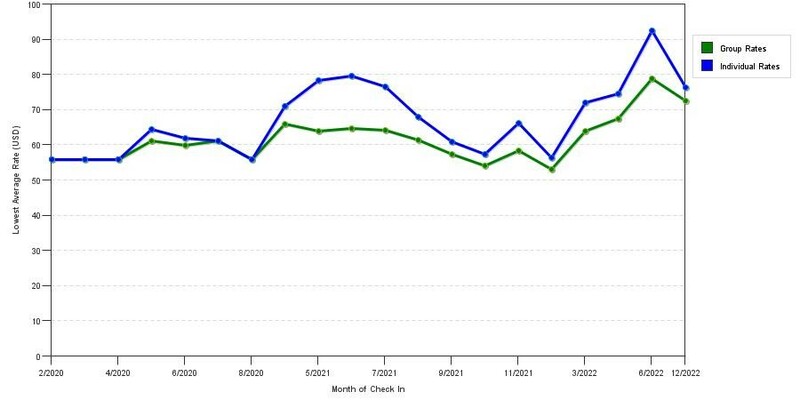 The graph above is averages of room rates for both our group rates and the lowest online individual rates our rate checker could find at the time the group/meeting offer was placed. The best group rate shown is 41.0% in October 2017 and the highest average individual rate is $72 in the month of October 2017. This chart will show past seasonality and also project future months. If you are flexible with dates, you may want to consider staying at Days Inn & Suites in a month when rates are lower.